We recently spent a fun evening at a friend’s house…eating, chatting, and playing games. Deea, the hostess (and one of my favorite people! ), made this watermelon salsa for everyone. It’s so perfect for summer…and being that I am obsessed with watermelon, I had to post it! It’s perfect for those of you who don’t like tomatoes or perhaps can’t have them due to the acidity. Perfectly sweet and tart…and wonderful on flax chips or on top of a salad! Thanks Deea for the photo and the recipe! Turn gently together to mix flavors and chill one hour or longer. I had watermelon-tomato salad on the 4th at a friends house. When I get the recipe I’ll have to get it to you. This looks great too! Alright, you were led by God to post this one today =) Seriously, I was trying to figure out what to make and bring to our finance class at church tonight, and this recipe seems simple, nutritious, AND delicious. I can hardly wait to try it! Being one of those people who doesn’t like tomatoes this sounds yummy. When I was in Thailand we made a fruit salad with jalapenos in it and it was so good; this reminds me of that somehow. Hmmm, I should dig out that recipe too! I just borrowed my sister’s Vitamix. (She’s out of town and doesn’t know I borrowed it yet. :>) The Butternut soup sounds great. Wow! That looks great and pretty and yummy! Wow! This looks really great. I’m going to have to try it soon. Oh my! I made this the other night and it was so yummy! Thanks for all the great posts. I’ve really enjoyed learning new recipes from you. Hello, I am designing a website for a wholesale produce grower and distributor. I am including a recipe page to try and introduce people to different ways of using cabbage, potatoes, pumpkins, and watermelon. 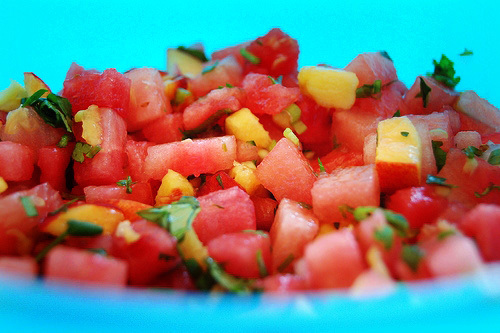 I found your recipe https://happyfoody.com/2008/07/09/watermelon-salsa/ and would like to include it and the accompanying picture on our page. It would be in the form of a pop-up window with a direct link to your page. This would also give you another credible link to your site. Please kindly take the time to respond with, a yes or no, thanks.